Join PQA and Pullizer winning photographer, Deanne Fitzmaurice, on our new and exciting Photoquest to photograph the unique Hornbill Festival, a vibrant festival celebrating the cultural diversity of the Naga tribes. The Hornbill Festival provides a colorful mixture of dances, performances, parades, games, sports, and religious ceremonies. The itinerary we've put together not only includes the the festival while staying at a luxury mobile camp, but also a photographic tour of Kolkata, a delight for street photography and a wonderful stay at Kaziranga National Park for elephant and jeep safaris in search of rhinos and tigers, oh my! The combination of an extraordinary leader, exciting festival, people and wildlife photography make this an unforgettable photography workshop not to be missed. Early in the morning we go out for an exciting elephant safari to observe the wildlife in the park. The elephants will take you close to the Rhinos to provide great opportunitties to shoot from a nice angle and distance. Later that day, we will venture to a nearby village to explore and capture great photos. Our late afternoon safari by Jeep with only 3 people per vehicle is the ideal situation to capture amazing images of the rhinos and tigers we encounter. The national park with a variety of birds in the green forest is also an ideal photo focus while on safari. Overnight at the Infinity Resort. This morning after breakfast, we will start our 6 hour drive to Kohima – the capital of Nagaland, where the Hornbill Festival takes place. Each of the 16 major tribes and many sub-tribes in the State has its own way of maintaining its distinctive cultural traditions and customs, through various forms of performing arts, which are an integral part of Naga festivals. The colorful and intricately designed costumes, jewelry and beads that members wear can distinguish each of the tribal communities that dwell in the hills. The traditional ceremonial attire of each tribe is different from that of the other. There are the multi-coloured spears and daos decorated with dyed goat's hair, the headgear made of finely woven bamboo interlaced with orchid stems and adorned with boar's teeth and hornbill's feathers, and ivory armlets. In the olden days, warriors had to prove their valor if they wanted to wear these. Overnight at the five-star Ultimate Travelling Camps for three nights. A single supplement is paid by participants who specifically request single accommodations, subject to availability. Deanne is a Pulitzer Prize winning documentary photographer and multimedia storyteller based in San Francisco, California. She is a regular contributor to Sports Illustrated and ESPN the Magazine, and has been published in TIME, Newsweek, The Economist, Stern, and GEO. Deanne’s work has received awards from Pictures of the Year International, NPPA Best of Photojournalism, and the Casey Medal for Meritorious Journalism. Her imagery is part of the permanent collection at the Newseum, and their traveling exhibition of Pulitzer winning photographs. Additionally, her work has been exhibited at Visa pour L’Image in Perpignan, France, and with UNICEF Photo of the Year. When not on assignment, Deanne often lectures and teaches workshops. Born in Brazil, Najat grew up in between the mountains of Lebanon and the skyscrapers of New York. Her diverse upbringing helped shape her desire to travel the world. 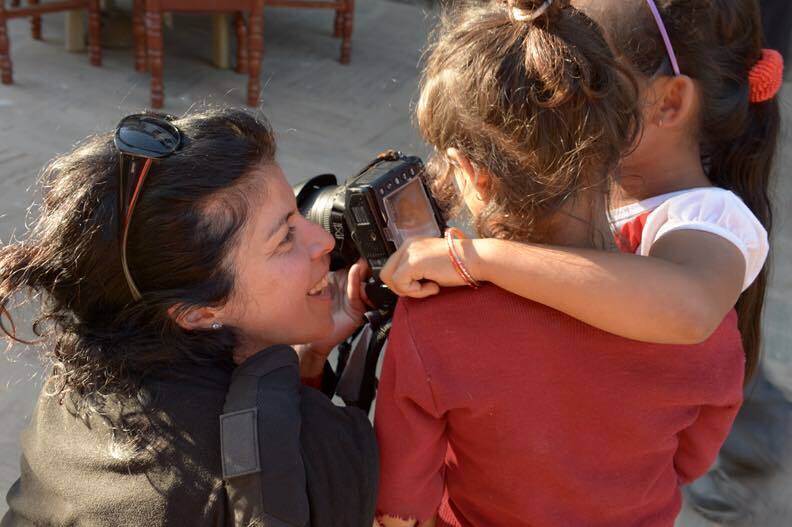 Leading workshops, she has introduced many groups to photography while still exploring the cultures and diversity of the more than 40 countries she's visited. Her gift for languages (she speaks Arabic, Spanish and English fluently and a bit of Dutch and Portuguese) has enabled her to put people at ease through out her travels. She enjoys the opportunity that workshops give her to meet different types of people and introduce them to the beauty and marvel of the world. A huge believer in giving back, she is dedicated to supporting local charities throughout her travels. Her work has appeared in NY Times Magazine, American Photo, Financial Times, Interior Design, Popular Photography, The Editor at Large, HGTC.com, Trail of Inspiration.com, mocoloco.com and Oprah.com. India is a land brimming with extremes and thriving with a kaleidoscope of colors, cultures, sights and sounds very different from our ordinary experiences. As a photographer, you will find India offers nothing less than a plethora of visual feasts for your senses and camera lens. Below are some facts about India to help acquaint you with this dynamic country and the regions we will visit and photograph. Located in South Asia between Pakistan, China and Nepal with the Bay of Bengal on the southeast and the Arabian Sea on the southwest, India spans 1,222,559 sq mi with an estimated population of 1,103,371,000. To the north, it is bordered by the world's highest mountain chain, where foothill valleys cover the northernmost of the country's 26 states. Further south, plateaus, tropical rain forests and sandy deserts are bordered by palm-fringed beaches. With its capital as New Delhi, India has three major geographic regions: the Himalayas, along its northern border; the Indo-Gangetic Plain, formed by the alluvial deposits of three great river systems, including the Ganges (Ganga); and the southern region, noted for the Deccan plateau. Hindi, English (both official), and other Indo-European languages, including Bengali, Kashmiri, Marathi, Kannada, Gujarati, Telugu, Punjabi, Urdu and Rajasthani in Rajasthan. The climate during our stay will range from 28 °C to 30 °C, and the minimum between 18 °C and 20 °C. It is considered a very pleasant time of year to visit. Light, wicking, high performance layers are always recommended in case it gets cool or if there is rainfall. Also, bring very comfortable walking or hiking shoes. India is a developing country with conservative dress standards. In smaller cities and villages, people still dress conservatively. The most important rule for both women and men is to keep the legs and shoulders covered. Wearing shorts and short skirts should be avoided. Indian food is diverse and varies from one region to the next. It is often thought of as very spicy, but there are some simple breads, sweet deserts, and milder 'one-pot dishes' that defy the norm. Many Indians are vegetarian. There are regional specialties, different ways to serve the meal, and staple ingredients in each state. Credit cards are widely accepted in major cities. ATM machines can also be found in most places, including small towns. Carry some US currency with you in small denominations. Indian currency is highly regulated and can't be purchased outside India, so it's a good idea to also carry some currency that you can exchange for Indian rupees upon arrival at the airport in India. US visitors to India are required to possess a valid passport and a visa. Visas can be obtained on arrival in India. As India is a developing nation, visitors need to take special precautions against illnesses not normally encountered at home. A trip to a doctor or travel clinic is recommended well in advance of your departure date to ensure that you receive all the necessary immunizations and medications. Cover for camera to protect from dust. $6900 based on double occupancy. Single supplement is an additional $1450. PQA will try to match you with a roommate if you do not opt for a single supplement. However, if a roommate is not available, you will be charged the additional single supplement fee.